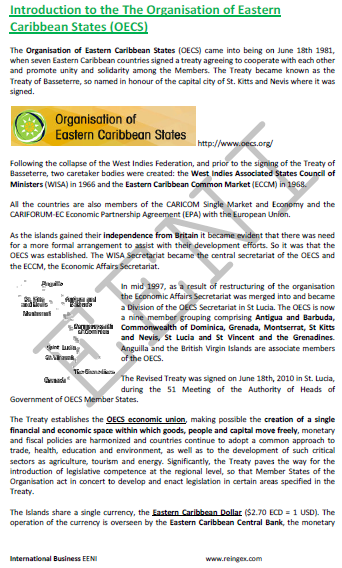 Syllabus of the Online Course (Subject): Organisation of Eastern Caribbean States (OECS). Learning materials in or Organización de Estados del Caribe Oriental Organisation des États de la Caraïbe orientale. Higher Education programs adapted to Caribbean students (CARICOM). Description of the Online Course: Organisation of Eastern Caribbean States (OECS). In 1981 was signed the Treaty of Basseterre, which created the Organisation of Eastern Caribbean States (OECS) by seven countries of the Eastern Caribbean. Today, the Organisation of Eastern Caribbean States consists of nine countries: Antigua and Barbuda, Commonwealth of Dominica, Grenada, Montserrat, St Kitts and Nevis, St Lucia, and St Vincent and the Grenadines. All these countries are members of the CARICOM. The main objective of the Organisation of Eastern Caribbean States (OECS) is to create an Economic Union (goods, capital, and people). All the seven countries of the Organisation of Eastern Caribbean States (OECS) share a common currency, the Eastern Caribbean Dollar issued by the Eastern Caribbean Central Bank. The Organisation of Eastern Caribbean States belongs to Christian Civilisation (Caribbean Economic Area).